Also known as “music smart“, learners who enjoy using a musical multiple intelligence lens demonstrate greater sensitivity to sounds, rhythms, tones, and music. Since there is a strong auditory component to this multiple intelligence, they will often use songs or rhythms to learn and memorize information. When presented with a challenge in a weaker area of the multiple intelligences, encourage your child to think about activities or ways that can link these weak areas to their strongest multiple intelligences. 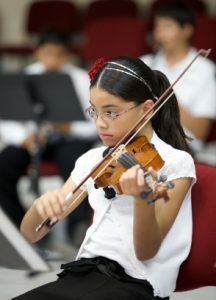 Parents and extracurricular mentors that “think” like your child can help them start to approach school in general from a musical multiple intelligence tact. For instance, creating a song that relates to a plant’s lifecycle—how a plant goes from seed to germination to shoot to leaves to fruiting and, once again, to seeding—can help them better understand botany in a context that comes naturally to them. Orchestras, bands, chorus, madrigals or solo instruments are natural fits for the child who demonstrates strong musical multiple intelligence. This being said, each person has the ability to develop all eight multiple intelligences so even if your child is strongly musical, don’t fall into the trap of focusing all of your energies in one area and excluding the others. Rather, use your child’s innate strengths (most likely more than solely musical multiple intelligence!) to approach challenges they may be having in weaker multiple intelligence areas so that you can more effectively nurture a “whole” child. Is Your Child Music Smart?